Belalua is a traditional restaurant offering Spanish cuisine. The average price of a main course dish at the Belalua restaurant is 20 euros. The average price of a 3-course meal at the Belalua restaurant is 45 euros. Note that although GoMadrid.com strives to maintain all information about Belalua up to date, the prices mentioned are only an indication and may not reflect the exact value of your meal. Located in the historic centre of Madrid, in one of the most charming pedestrian areas of the city, Belalúa belongs to the best restaurants of the capital. At this special place, you can enjoy delicious food whilst listening to pleasant lounge music. They offer a menu where the flavoured dishes of Northern Spain are the main feature, with fresh fish on a daily basis, the best cuts of meat, combined with an excellent wine list. If you choose to sit on the terrace, you can enjoy the magnificent atmosphere of this old district of Madrid. 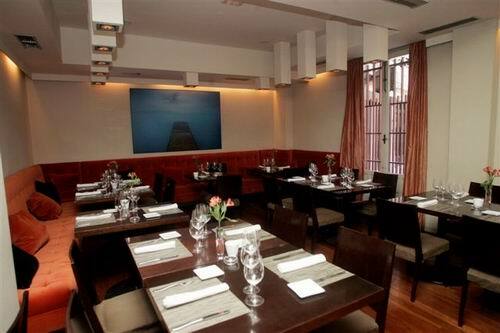 The address of the Belalua restaurant is: San Nicolás 8, 28013 Madrid. The nearest Metro station is Opera. Please see the Belalua restaurant location map below.